It is with great excitement that I announce our November sponsor for our Moggy of the Week competitions – Present Purrfections. Set up by Julie Martin-Davy, a true cat lady at heart, although she denies the crazy part (lol), Present Purrfections is an online shop selling quality gifts for cat – and dog – lovers. The online retailer has been selling gifts for cats since its inception in 2014, and has been shortlisted for a number of awards , including being one of only eight Scottish businesses to be chosen as one of the 2015 Small Business Saturday Campaign’s #smallbiz100 finalists and making it onto Scotland’s Business Award’s “Best Fife New Business 2016” list. Present Purrfections was also a finalist for the Scottish Independent Retail Awards, in the “Bespoke Retailer” category. WHY IS THIS CAT LOVER’S GIFT SHOP SO SUCCESSFUL? Simply because the owner, Julie, is a cat-lover. She herself has two kitties call Pip and Squeak (aka the Pipsqueaks). The PipSqueaks are two mischievous rescue kitties and Julie agrees with My Moggies and Me’s motto that everyone should adopt from shelters whenever possible. In fact, Present Purrfections wholeheartedly supports animal charities as Julie fundraises from time to time to donate to her nominated charity, Fife Cat Shelter. Over the course of the first year alone, Present Purrfections raised over £280 for the shelter. Up to and including Friday 02 December, our generous new sponsor, Present Purrfections, will be giving away a free Foldable Cat Shopping Bag (usually priced at £4.95) to each Friday’s winning Moggy of the Week. 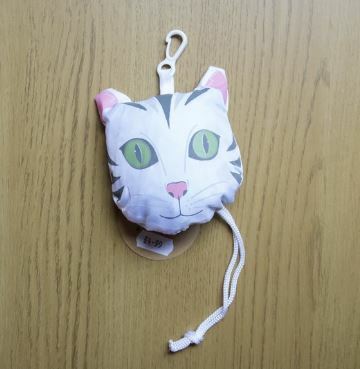 To enter your cat in our weekly competition to win this super cute kitty-face shaped, toggle closure bag – that opens out into a cat scene and can be clipped to your handbag, just send in some details with photos of him or her, including their name and age plus an anecdote on what makes them a deserving winner, to info@mymoggiesandme.com. 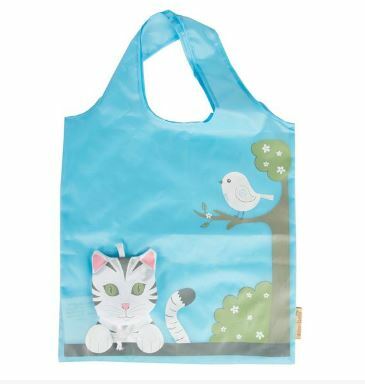 I’ve just won Moggie of the Week and received a lovely bag – which is great as I lost one of my reusable bags last week.